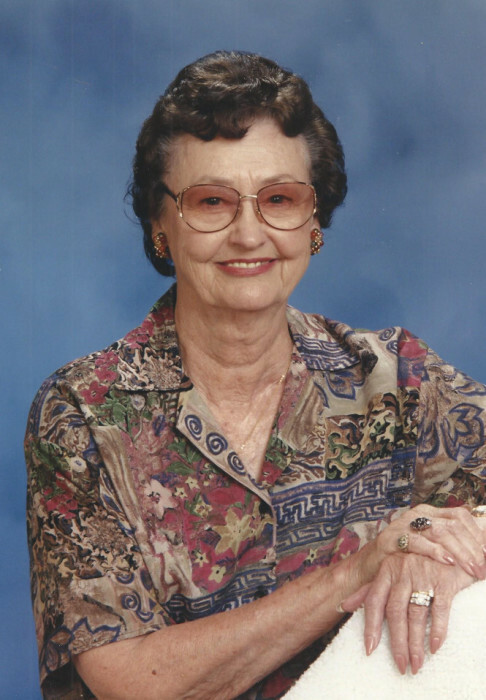 Mrs. Clara Mae Covington passed away at Antelope Valley Hospital in Lancaster, CA on January 14, 2019. She was born April 8, 1922, in Daisy, Oklahoma, the 6th child of Dr. Henry A Ellis and Katie Ellen Jones, She married John William (Bill) Covington January 21, 1939. She gave birth to three sons: James Ellis Covington, William Clois Covington, and Robert Allen Covington. She was preceded in death by her husband John, son James, her parents, four brothers: Bryant Ellis, Percy Ellis, Ralph Ellis, and Nathan Ellis, and sister Lucille Frederick. Clara, known by friends as “Nicky”, was raised in Pittsburg, OK and went to school in Savanna, OK. She met her husband and they were married on January 21, 1939 in Poteau, OK. During WWII She and John worked for Douglas Aircraft in Oklahoma City before John enlisted in the Army Air force in 1944. Following his discharge in 1945 they moved to Carlsbad, NM where John went to work for U.S. Potash (US Borax and Chemical Co.) Clara began working as a representative for Avon Products; worked for a music company, attended night school to earn an Associate degree in Business, drove a school bus and started her own business “The Drape Shop”. She was injured in an automobile accident in 1958 and was unable to work for the remainder of her life. Following closure of the mine in Carlsbad they moved to Boron, CA in 1969 where John was rehired as a supervisor at the US Borax’s mine in Boron. They purchased their home in Lancaster in 1974 where she resided 45 years until her passing. She passed 36 years and one day following John’s death in Lancaster. John was a 32nd Degree Mason and Past Master of Eddy Lodge 21 in Carlsbad, NM and Clara belonged to Chapter 18 of the Order of the Grand Chapter of New Mexico Eastern Star. She is survived by sons: William and daughter in-law Regina Covington of Camas, WA, and Robert and daughter in-law Mary Covington of Ridgecrest, CA, Daughter-in-law Sally Covington of Carlsbad, NM, Grandchildren: Phillip Covington, Jason Covington and Frank Tyler Covington of Portland, OR, Julie and husband Mark Fleck of Mandan, ND, John R. Covington and wife Darcy Saint-Amant of Leesburg, VA, Neil and wife Brooke Covington of Enterprise, AL, Laurie Covington of Los Olivos, CA, , Ashley Covington and husband Preston Harvey, and Jamie Covington of Carlsbad, NM, great grandchildren: Robert Covington, Simon Wood, Zoey Covington and Conrad Covington and Niece Nancy Ratcliff of Springfield, MO. Graveside Services to be held in Carlsbad, NM at a future date to be announced.